1931 attempt to reach the North Pole via submarine, with an intended meeting with the Graf Zeppelin airship at the North Pole. With cooperation from wealthy explorer Lincoln Ellsworth, a O-class WWI-era submarine was leased from the U.S. Navy, christened Nautilus, and extensively modified (but little tested). Leaving U.S. waters in June, the submarine had many breakdowns. Foundering in the Atlantic, the sub was rescued and towed to Ireland and then taken to England for further repair; eventually the sub reached Bergen, Norway. Leaving Bergen on 5 August, the sub reached ice on 19 August. When first attempting to dive under the ice on 22 August, it was discovered that the stern planes had apparently been sabotaged. On 31 August an attempt to make a short dive under the ice using ballast and ramming the ice was "successful", but did extensive further damage. (The sub was thought lost and rescue plans were formulated.) The sub arrived at Longyearbyen, Svalbard (Spitzbergen) on 8 September. Storms and further major damage forced the sub back to Bergen instead of England; the hulk was returned to the U.S. Navy and, due to the damage, it was scuttled on 20 November at Bergen. Fundraising philatelic covers were created to support the expedition. Most covers bear a handstamped cachet picturing the sub, usually in shades of magenta. They bear additional handstamps such as "NEW YORK TO NORTH POLE", "NEW YORK TO BERGEN", and "NEW YORK TO SPITSBERGEN". They have dual addresses and postage; first sent (normally originating with U.S. stamps) to Wilkins at New York, and then mailed back to the original sender from Bergen, Longyearbyen (Spitzbergen), and England. 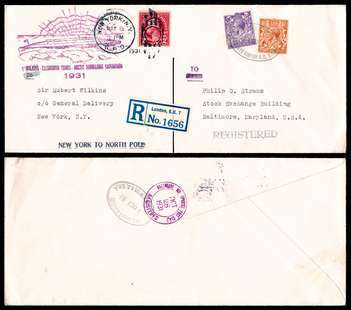 1931 Wilkins-Ellsworth Trans-Arctic Submarine Expedition: New York to Spitzbergen leg with violet expedition handstamped cachet and black one-line "NEW YORK TO SPITSBERGEN" handstamp. May 8, 1931 U.S. franking to Norway. Longyearbyen (the primary settlement on Spitzbergen island, Svalbard) 1 August 1931 franking back to the U.S. The submarine had problems and never reached the North Pole as planned, but the resulting covers are interesting polar postal history. For reference only. NOT for sale. 1931 Wilkins-Ellsworth Trans-Arctic Submarine Expedition: Bergen to North Pole leg. 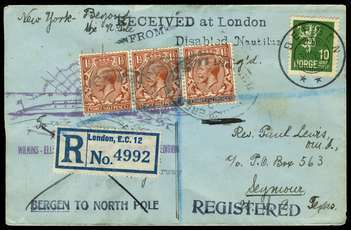 Bergen 3 August 1931 franking on the way to the North Pole. With "RECEIVED at London / FROM / Disabled Nautilus" handstamp upon arrival in London. There franked with British postage and sent registered back to the U.S., with U.S. receiver. The submarine had problems and never reached the North Pole as planned, but the resulting covers are interesting polar postal history. 1931 Wilkins-Ellsworth Trans-Arctic Submarine Expedition: New York to Bergen leg. 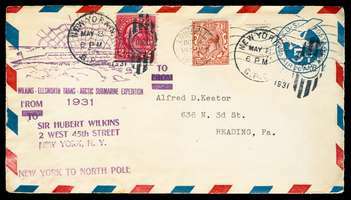 May 8, 1931 U.S. franking to Norway. Bergen 4 August 1931 franking back to the U.S., with U.S. receiver. The submarine had problems and never reached the North Pole as planned, but the resulting covers are interesting polar postal history. 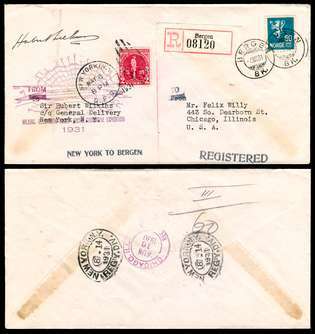 Wilkins-Ellsworth Trans-Arctic Submarine Expedition 1931 "NEW YORK TO BERGEN" in black; magenta cachet. 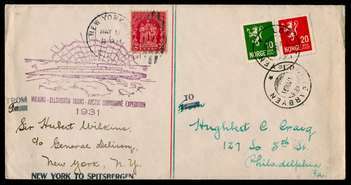 8 May U.S. postage to Wilkins; 4 August Norwegian postage, canceled at BERGEN, registered back to originator. Very attractive and SIGNED BY HUBERT WILKINS. 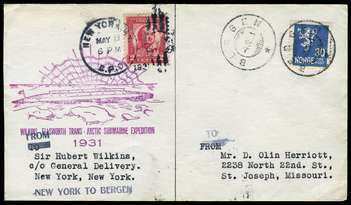 Wilkins-Ellsworth Trans-Arctic Submarine Expedition 1931 "NEW YORK TO SPITSBERGEN" in black; reddish magenta cachet. 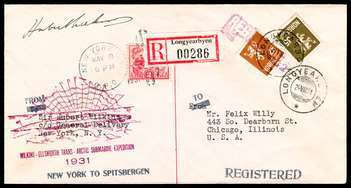 8 May U.S. postage to Wilkins; 24 August Norwegian postage, canceled at LONGYEARBYEN, registered back to originator. Very attractive and SIGNED BY HUBERT WILKINS. Any early Spitzbergen cover is scarce and desirable! Wilkins-Ellsworth Trans-Arctic Submarine Expedition 1931 "NEW YORK TO NORTH POLE" in magenta (instead of the usual black); magenta submarine cachet. 8 May U.S. 2 cent stamp on 5 cent airmail postal stationery envelope, to Wilkins; 4 October British 1-1/2d postage back to originator. Opened on three sides. Contains letter from original asking that, if found, the cover be sent back to him -- maybe he thought the expedition would fail even more dramatically than it did. Very attractive. Wilkins-Ellsworth Trans-Arctic Submarine Expedition 1931 "NEW YORK TO NORTH POLE" in black; magenta cachet. 8 May U.S. postage to Wilkins; 19 October British postage (one stamp defective but looks nice) registered back to originator. Very attractive.